Smaller leaks add up to substantial amounts of damage. Big oil spill disasters such as BP’s in 2010 and Taylor Energy’s in 2004 garner widespread attention and are followed by the infliction of hefty penalties on the corporations responsible. Some argue, however, that it’s too early to even begin to assess the full environmental ramifications of these incidents at the time penalties are determined. While these disasters are impossible to ignore and remain in the public eye for a long time after they happen, experts warn that we shouldn’t ignore the cumulative smaller leaks that attract less attention and less clean-up funding. Spills of less than 100,000 gallons are classified by the Coast Guard as minor or moderate, but the damage they can cause is anything but. Just a few molecules of oil can kill a fish or cause air-breathing creatures like dolphins and turtles to contract fatal health issues. An estimated 30,000-plus spills classified as small occur each year, so that’s a lot of potential damage that never makes the news. 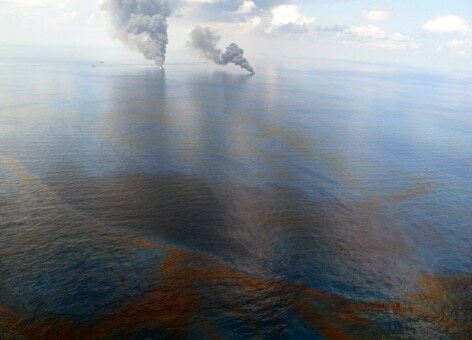 The Deepwater Horizon oil spill of 2010, the largest oil spill in U.S. waters. National Oceanic and Atmospheric Administration. Perhaps most troubling is that we don’t have a way to know how big a spill is, so these “small” spills could potentially be much more significant. SkyTruth, a non-profit organization that tracks oil spills and other environmental threats, uses satellite data to calculate oil spill amounts and compares their estimates with what corporations report they have leaked. Unsurprisingly, the satellite data shows there are 13 times more oil slicks than corporations care to admit, and they get away with it. “We make an estimate and compare it to [an] estimate they submit, and they usually don’t add up,” SkyTruth program coordinator David Manthos tells Wired. “There are penalties for not reporting something that you should have seen, but no penalties for underreporting,” he adds. Changing that would be one step toward fixing this problem. Government-mandated upgrades on old and failing equipment, making it more difficult for companies to obtain oil leases, and a general increase in regulations could all go a long way toward making off-shore drilling less damaging to the environment. However, the practice will always be risky, so until we embrace clean-energy alternatives, fossil fuels will continue to create messes — in our water, land, and sky.